I honestly like just about every handbag Linea Pelle releases, but the Alyssa is really something to look at. Though probably most popular in the bright purple dawn color, which you can see on the previous giveaway page, this ultra understated sand storm color will definitely be more versatile to a wardrobe. 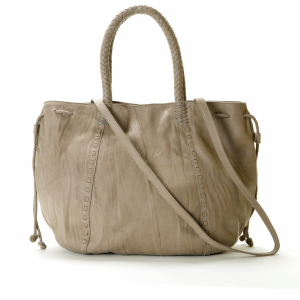 The light beige doesn't exactly make a statement, but the details on the tote are enough to impress. As you'd expect from a designer handbag, the Alyssa is made from high quality material. The Italian lambskin leather has a washed effect making it both unique and a little casual. There's a recurring theme of braided, rope-like detail seen on the double handles as well as the trim woven through the top. A magnetic closure keeps your valuables inside the zebra-lined interior of the Alyssa Tote. This large designer handbag retails for $495.